Lord Coe was speaking to PB magazine, issued this weekend to 13,000 scottishathletics members. 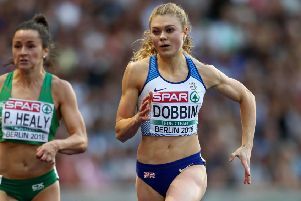 The scottishathletics FPSG Athlete of the Year won two medals at the World Indoors back in March and then claimed European gold in Berlin and took victory in the Diamond League 1,500m final in Brussels. 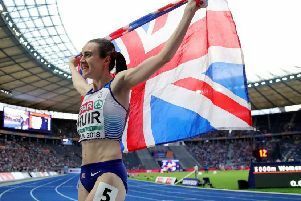 Muir was then named No 1 in the world for women’s 1,500m under a new rankings system by the IAAF in a huge compliment to the 25-year-old Scot. Coe, of course, heads up the global governing body and the IAAF president is a big supporter of the Glasgow-based athlete, whose 2018 also included her graduation as a vet from Glasgow University. “I am a fully paid-up member of the Laura Muir Fan Club,” Coe told scottishathletics. “She’s a top athlete and she’s hasn’t had it easy by any means to reach the top. “I actually had a long chat with her at Zurich way back in 2014 when she had struggled at the Europeans just after the Commonwealths. It has been exciting, and pleasing, to see her come a long way since then and pick up medals in first Belgrade, when she won double gold at the European Indoors and then this year at the World Indoors in Birmingham and the Europeans in Berlin. “Let’s be honest – Laura has chosen one of the toughest sports in the world in which to try and medal and she has chosen the toughest disciplines, with the African behemoths in opposition. On top of all that, through luck or judgment, she had the toughest degree course in veterinary medicine. “So I take my hat off to her absolutely on her achievements this far. I would even suggest that in Scottish sports terms she is very, very good indeed. Down the years you have not had other women running under four minutes for 1,500m and not too many under two minutes for 800, either. Or under 15 minutes for 5,000m. She has quite a range of distances, doesn’t she? “I think what all of that says is Laura has incredible mental strength. Muir, who has declared her 2018 efforts left her both thrilled but drained, heads this weekend for warm-weather training in South Africa ahead of the European Indoors at Glasgow 2019 where she looks set to defend the 1,500m title she won in Belgrade in 2017.